Methodology – Business Strategy model is an approach to developing a company’s strategy and ultimately resolving business problems and creating a unique market position. The business strategy development process starts with understanding of one’s mission, beliefs and values. Then company needs to understand where it currently stands, e.g. via a conducting a SWOT analysis. Then the company is to set goals and priorities, establish targets and measures and finally develop a roadmap or an action plan. 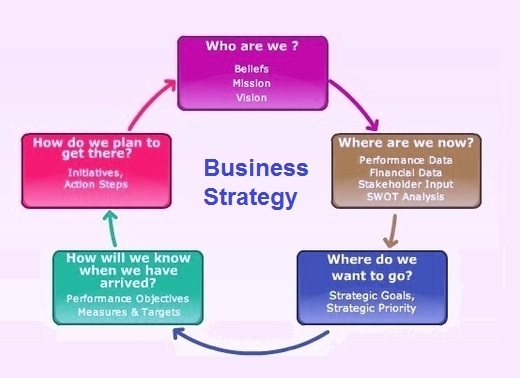 Below sample images are examples of Business Strategy development cycle used by company’s management. This entry was posted in Strategy and tagged business strategy, business strategy analysis, business strategy approach, business strategy business, business strategy chart, business strategy diagram, business strategy example, business strategy examples, business strategy explained, business strategy framework, business strategy methodology, business strategy sample, business strategysamples by admin. Bookmark the permalink.